Fun fact about me I love sports movies! Okay, so I don't love them more than "chick flicks" and period dramas, but I still love watching them and have seen so many in the course of my life:) I think my love for sports movies started when I was young and we would always watch movies as a family, most often than not the movies we would watch would have something to do with sports. However, that's not all that much of a surprise considering my dad is a coach, and my brother and sister were and still are involved in sports, so I basically grew up in a sports family as a "coaches kid" (which honestly was awesome). 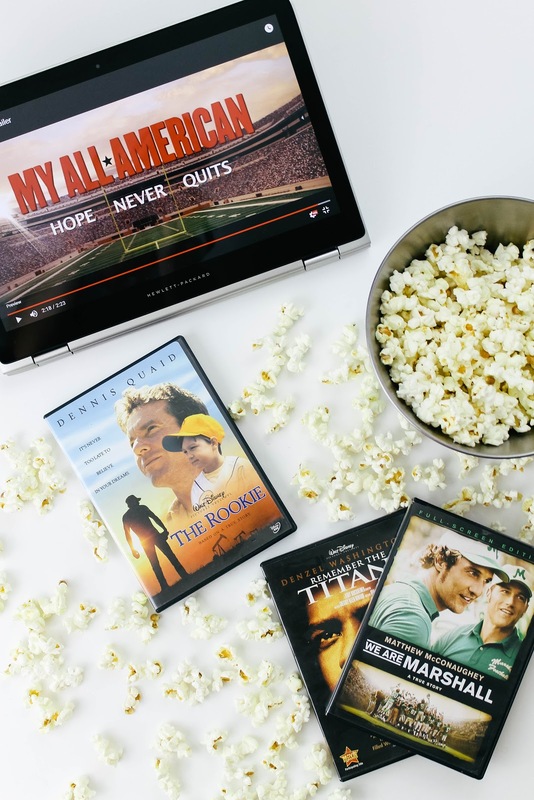 The Rookie - This movie was one of the first sports movies I remember watching and still to this day remains one of my favorites and definitely one of my favorite movies in general (plus Dennis Quaid always reminds me of my dad). Fun Fact: Parts of this movie were actually filmed in both of my parents home towns (which are 15 minutes apart) so I have literally been to the places scenes from this movie happened...sooo cool! Okay, but seriously I LOVE the story line of this movie in following your dreams, never letting others tell you that you cannot do something, inspiring others, and all around bringing people together for the love of baseball. My All American - Ugh.....LOVE this movie! This movie will make you cry like a baby but it is soooooo good! There are so many reasons to love this movie, it is set in the 60's, it is a true story, the actors are amazing, and the story is inspiring! Remember the Titans - This is a classic! I have probably seen this movie close to five times and it's still so good! The movie starts out with the two high schools integrating their students and the players of both football teams have to deal with the changes as well as learn to accept each other and play as a team. This movie deals with prejudice, race, learning to accept and love others, and form bonds of not only teammates but brothers. League of Our Own - I love this movie because it is not your typical sports movie. This story focuses on an all women professional baseball team that was started during WWII as all the men leave for war. Tom Hanks plays their coach and it is quite entertaining to watch him try and rally a group of women to win games while inspiring everyone at home. Angels In The Outfield - Definitely the perfect family night sports movie! When a boy in foster care prays for a chance to have a family if the California Angels win the pennant, angels are assigned to make that possible. Field of Dreams - The classic quote "If you build, he they will come" originated in this movie as a farmer hears voices talking in the cornfield one night. Even though everyone thinks he is crazy he builds a baseball field in his backyard, after which the ghosts of some of the greatest baseball players start emerging from the cornfield and start to play ball. Rudy - Love this movie because it reminds me that our dreams are never to big and that they can always come true! Rudy doesn't want the life of everyone else, stuck in his town, working in the steal mill. He eventually gets into his dream college and works harder than any football player to reach his dreams as everyone around him takes notice and is inspired. Facing The Giants - This movie is an inspiring story of faith and overcoming giants both on and off the football field. Every scene leaves you inspired as a sports enthusiast and as a Christian as you watch the characters in the movie question God and rededicate their Faith. Blind Side - A truly great football movie, inspired by a true story, about the power of love and family to help you recognize your potential and passion for something bigger than yourself. Miracle - If you are a hockey fan than this movie is for you! Okay, so you don't actually have to like hockey to LOVE this movie as it is inspired by a true story of the 1980's men's hockey team. As America is at odds with the Soviet Union during the Cold War, the men's hockey team is set to face the Soviet men's hockey team for the Olympic Gold. What they accomplish is nothing short of a miracle and inspires patriotism throughout America. Do you like sports movies? I grew up in a big sports family too (and I find the "dumb" jock and "smart" nerd stereotypes rather annoying, we are smart and sporty, well I'm not very sporty, but that was more choice). I'm the least athletic, but sports is in my blood and I'm super competitive. I don't watch hockey, but I love Miracle; it is such a good movie and interesting story (all the cute guys help of course, lol). I've seen The Rookie, ages ago. Dennis Quaid annoys me though. I've seen Facing the Giants and a teeny bit of The Blindside. I'd like to add a few of these to my list. My dad and brother like Moneyball. I have seen several of these and I just bought Miracle at Goodwill! Here is another fun fact; parts of Remember the Titans were filmed at Berry College which is in my hometown in Georgia! That is one of my all time favorites! I still haven't seen "A League of Their Own" but I want to so bad! I think Tom Hanks is just the best! Wait! My sister just told me that we can find it on Hulu! I know what we're watching tonight! :) Thanks for giving us the idea!